Join us at SMARTS on Friday, August 3 at 10 am to see Doug Smith as he continues his journey “Going the Distance” for SMARTS. He will share some stories about his trek and the people he has met along the way. 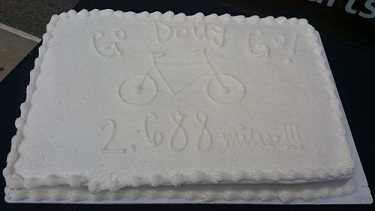 We will be celebrating Doug’s birthday with cake and encouraging him as he continues to the east coast. Doug Smith started his journey in Astoria, OR on June 7 and he will put his feet in the Atlantic Ocean on August 11 at Rehoboth Beach, DE. When Doug reaches Youngstown, he will have travelled 2,688 miles to date with 500 miles left in his journey. Doug has travelled 85% of his journey, but SMARTS is only currently at 10% of our $35,000 goal to raise funds for SMARTS Public Programming. SMARTS offers free classes in visual arts, music, dance, theater, and visual arts with over 50% of its students at low to moderate income based on HUD standards. SMARTS encourages the community to support “Going the Distance” for SMARTS by making a donation and follow Doug’s journey at https://www.smartsartschool.org/going-the-distance-journey/.